It’s snowing! When snowflakes flurry, you’ll want to run outside and catch some with your tongue. But don’t forget your First Snowfall Slouch Hat. This popular crochet pattern combines stitches in a way that’s as unique as a snowflake. This slouchy hat stays in place with the ribbed band that is worked first as a long strip, folded in half, and then stitched together with single crochet. But that’s just the beginning of this innovative design. The waistcoat stitch alternates in bands with extra extended single crochet for a ton of texture and interest. 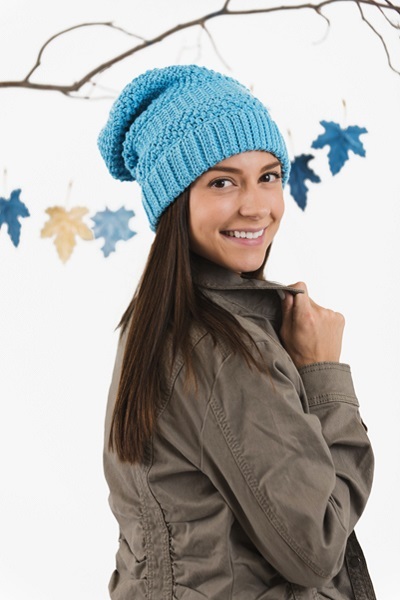 You’ll love crocheting the First Snowfall Slouch Hat! Because it’s worked in an acrylic/cotton blend, this hat is light and comfortable to wear. The turquoise yarn shown brings a clear winter sky to mind. But any solid-color yarn will complement the design. Match your jacket, your mood, or your eyes—the First Snowfall Slouch Hat looks terrific on everyone. Wear the First Snowfall Slouch Hat out to play in the snow, when you’re walking the dog, or on your way to work or class. It’s perfect for gathering around a fire pit roasting marshmallows and sipping hot chocolate or mulled wine from a mug. Designer Jennifer Ryan, who enjoys spending time outside and photographing wildlife (even in the snow! ), created this pattern for I Like Crochet. Jennifer specializes in combining crochet with Celtic knots, and her love of unusual crochet stitch pairings is reflected in this hat. 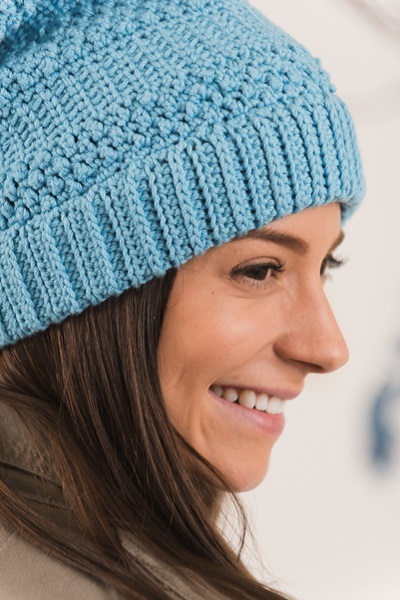 From the first sparkling snowfall to the first hint of spring, you’ll love wearing the First Snowfall Slouch Hat all winter long. This pattern is included in the October 2017 issue of I Like Crochet. And wouldn’t you just love to access it anywhere you go? You can! If you become a Gold Club Member, you’ll be able to view this crochet hat pattern on your laptop or tablet – whichever device you prefer! Of course, when you’re a Gold Club Member, you’ll also get stitch tips and tutorials, and—don’t forget—hundreds of patterns for everything from fun cozy scarves to romantic shawls. And remember, you can take all of it with you wherever you want to crochet – on the sofa, at the park, on a plane or train … well, you get the picture. Can i see this information on my cel phone and also on my tablet?